If you’ve ever found a five dollar bill on the street, it probably made your day. I mean, we see pennies and dimes on parking lot pavement all the time, but how often do you come across dollar bills, much less larger bills? Not very often. Well, a handful of Illinois residents may have been feeling pretty lucky this week. On Tuesday, a black sedan was making its way down Illinois’ I-74 when the driver lost control. The vehicle spun out, slamming into a guardrail before hitting a flat-bed truck. During the accident, it began to rain something unusual: money. Apparently, the sedan driver had just won thousands of dollars from video gambling machines. The driver was transporting the money in the trunk when the accident occurred. 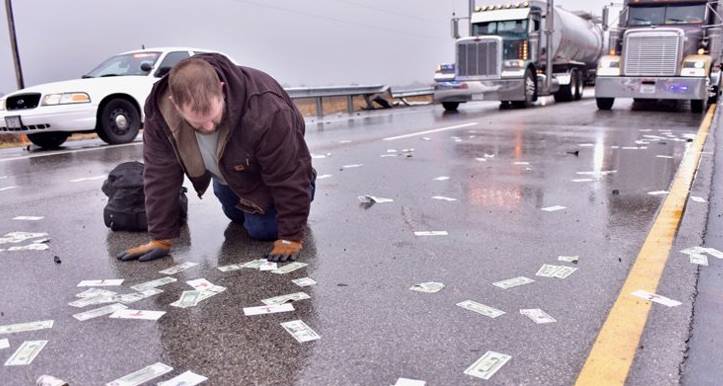 Five, ten, and twenty dollar bills were scattered all over the interstate as state police officers tried to pick them up; the incident caused the interstate to close for at least an hour, backing up traffic for more than four miles. Thankfully, everyone involved in the accident is in stable condition. The sedan driver was taken to the hospital with minor injuries and the other drivers involved only sustained a few cuts and bruises. Unfortunately for the rest of us, all of the cash has been cleaned up, so you won’t have the opportunity to line your pockets this time around (although, if you ask us, we’d probably bet the wind blew some stray bills away). Drivetrains: What are the benefits of four-wheel drive?